Home Horses The Arabian Breeders' Magazine: The Breeders Interview - Forelock’s Arabians, The Netherlands. 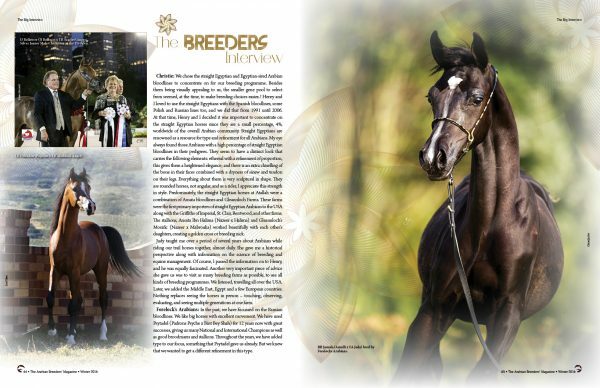 The Arabian Breeders’ Magazine: The Breeders Interview – Forelock’s Arabians, The Netherlands. The Breeders Interview – Forelock’s Arabians, The Netherlands. Forelock’s Arabians, The Netherlands: Established in 1972, Forelock’s Arabians, owned by the Kuijf family, is one of the largest and most successful Dutch Arabian horse farms based in the Green Heart of The Netherlands. Located in the town of Nieuwkoop, we maintain 10 hectares of grassland and 50 stables, as well as indoor and outdoor arena facilities. Our history began over 40 years ago with our foundation mares Nesmejana (Arax x Nevidimka) and Nezabudka (Arax x Napersmitsa), both imported from Russia and bought by the farm’s founders, Adriaan and Henny Kuijf. Internationally world-renowned stallions such as Menes (Nabeg x Metropolia), Abakan (Balaton x Amunitia) and Kais (Pakistan x Proba by Balaton) were kept at the farm. 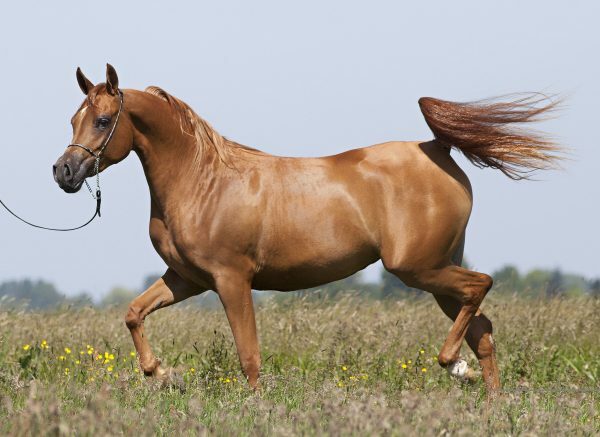 There, they bred many mares and their offspring endure and prosper worldwide today. Six years ago, Adriaan and Henny handed over the reins of the farm to us, their eldest son Aad Kuijf, and my partner, Wendy Jane Delvalle. I have been involved in the national and international Arabian horse breeding scene for most of my life. Wendy is an accomplished equestrian and show-jumper, as well as trainer and Arabian horse handler, and she has been active for well over two decades. Throughout her career, she earned numerous regional and national titles. Together, we made a selection of the horses in 2010 and kept thirteen of the farm’s most promising broodmares. As a couple, we combine valuable expertise and genuine enthusiasm in showing Forelock’s Arabians’ gorgeous aristocrat lines to a higher level, as well as in taking our breeding programme the next step up. For the past 10 years, the farm has bred over thirty Dutch National and Reserve National Champions, with the champions all stemming from the foundation of the three main lines at Forelocks – L, Y and V – and all leading back to Arax. Forelock’s Yinx (FS Reflection x Forelock’s Yessy by Psytadel). Credit Glenn Jacobs. Forelock’s Arabians: In the past, we have focussed on the Russian bloodlines. We like big horses with excellent movement. We have used Psytadel (Padrons Psyche x Bint Bey Shah) for 12 years now with great successes, giving us many National and International Champions as well as good broodmares and stallions. Throughout the years, we have added type to our focus, something that Psytadel gave us already. But we knew that we wanted to get a different refinement in this type. We still have two straight Russian mares, Forelock’s Lunette (Kais x La Belle by Abakan) and Vekaisa ‘F’ (Kais x Veronia by Abakan). Vekaisa gave us a filly, Forelock’s Veronique, and a colt, Forelock’s Voltaire, both by Psytadel. They both became National Gold Champion and National C Gold Champion. Veronique was Gold Champion many times at international shows for her new owner, named the 2015 Junior Gold National Champion and the 2016 Junior Silver National Champion of Iran. Voltaire was European Bronze Champion Colt Foal and Elran Cup Silver Champion, following in his sister’s footsteps. Voltaire will start a new career as breeding stallion in China. 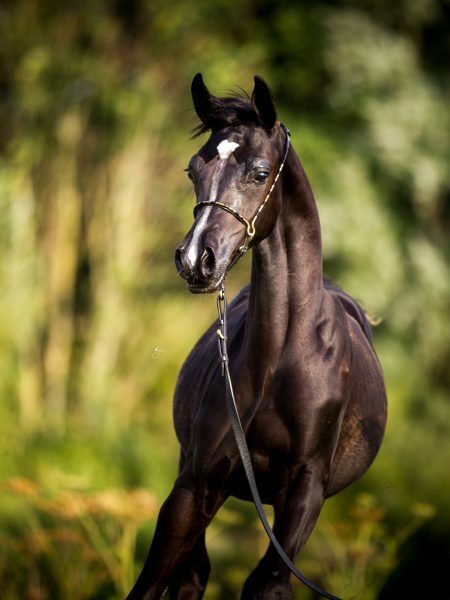 Our main goal still remains to breed a good Arabian horse, with good legs, a good body and good movement. We also want our horses to be good in sports, at any level, especially as most colts will go on to be sports/recreational Arabians as geldings. We have had several horses excel in their field of sports including: Pentor (Abakan x Pengona HT), a Western Champion at national and international level and also European Champion at the Arabian Sport Horse competition in Poland, and he also won the WAHO Trophy for his achievements as a sport horse; Korinto (Almonito x Konkubina), National Western Champion; Salomo Djinti (Nijni x Strelitzia), a Fasna Trail Champion with ten 160km FEI starts; and Ysabella F (Almonito x Yosraya), a National and International Dressage Champion and twice a winner in the dressage competition in Aachen. Knowing that we wanted extra type, we bred to Magic Magnifique (True Colour x Magic Mon Amour), and he did give us what we wanted in terms of type. Unfortunately, he also gave us four colts! We are currently using his son, Forelock’s Shaheen (ex Yody ‘F’ by Kubinec), in our programme. Shaheen is a great stallion and it turns out that he is also an excellent sire, giving high-legged type foals. We are keeping a black son of Shaheen for the future, Forelock’s Black Jack, a typey colt with an extreme neck and movement. Black Jack’s mother is the exotic BB Jamala, who is sired by Amalfi (Padrons Psyche x RD Bey Shampagne) a full brother to US National Champion, Enzo. Jamala’s dam, FA Jada (Padrons Psyche x Hafati Julianna), was imported from the US by Double B Arabians and she has proven to be a superb broodmare. FA Jada is also a full sister in blood to OFW Psylhouette, dam of World Champion EKS Alihandro. We are very pleased with Jamala as new asset to our breeding programme, especially as she carries the double Padrons Psyche/Bey Shah cross. 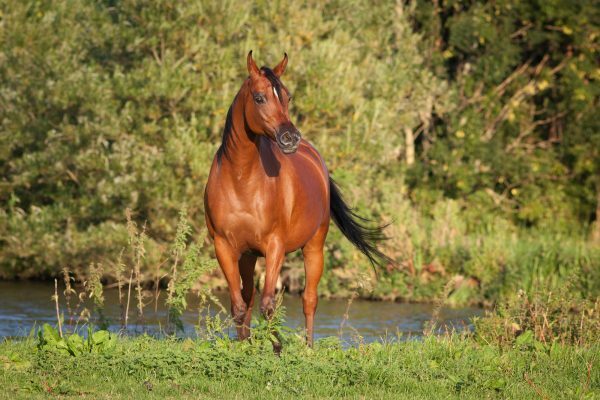 We also used Bashir Al Shaqab (Marwan Al Shaqab x SWF Valencia) for the past three breeding seasons. In general, Bashir gave us well-built horses with a more upright neck and also a great show attitude. We are very pleased with the results. We now have five fillies by him, and will show two of them next season. 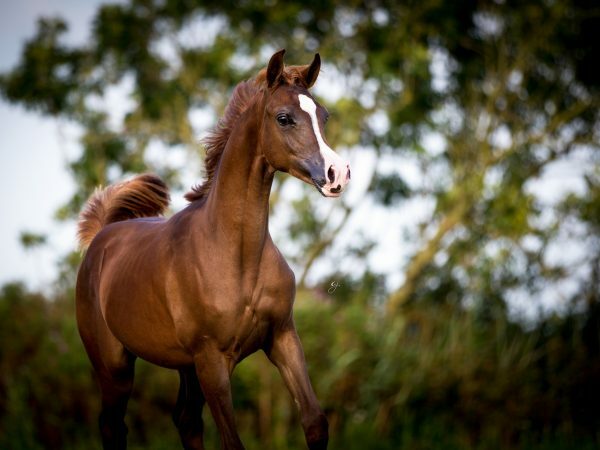 BB Jamala (Amalfi x FA Jada). Credit Forelock’s Archives. Forelocks’ Arabians: Our breeding goals have always been centred on breeding a very good Arabian horse with excellent movement and attitude. This has never, and will never, change. We still maintain this goal and while we may take a side step if we think that this will help us reach our goal, we never really give up on good movement and good bodies. Forelock’s Arabians: A moment that stood out was our colt Marhaba (Nagasaki x Nezabudka). He really stood out, and became Dutch National Champion in 1978. His dam, Nezebudka (Arax x Napersnitsa), was one of our foundation mares and is still found in our ‘L’ line today. We sold Marhaba to the United States as, at that time, there was great demand for horses like him, and we would go on to sell more of our Russian mares and stallions to the US. Marhaba still is found in the pedigree of many famous horses today, probably the most famous being QR Marc (Marwan Al Shaqab x Swete Dreams) through the damline. Another early special moment was Lyanka, a daughter of Abakan and out of Lanizjka (Nizjini x Lavinia). 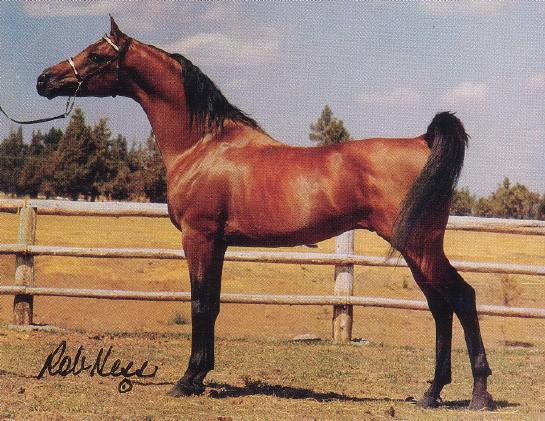 She was purchased by the Jones family of Bychan Arabians in Wales as a foal. The next year, in 1997, they took her to the British National Championships and she became British National Champion from around 300 fillies! We were very happy, and this was the start of a lifelong friendship between us and the Jones family. The first year that the Polish came to the All Nations’ Cup in Aachen with their most famous and wanted Monogramm (Negatraz x Monogramma) daughters such as Kwestura (ex Kwesta by Pesennik), we also participated with our filly, Veronia (Abakan x Veranda). This was in 1996 and each class had a large number of horses entered. We were very lucky as all the Polish fillies were in other sections, so we won the first group of yearling fillies! 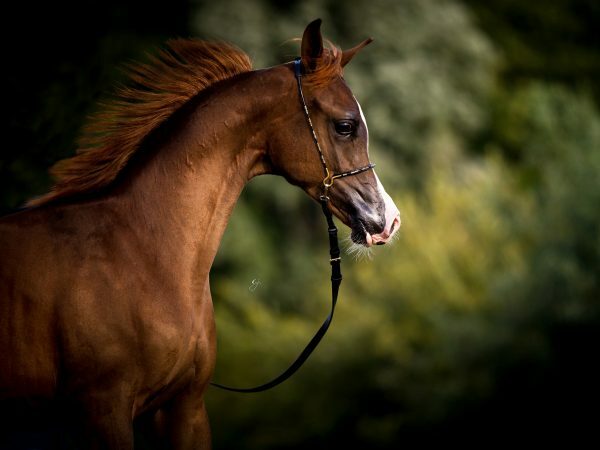 Veronia was later sold together with her Psytadel daughter Valentyna ‘F’ to Al Hawajer Stud in the United Arab Emirates. Valentyna later was shown with great success, including winning at the Arabian Breeders’ World Cup in Las Vegas, taking the Bronze Championship at the Ajman Show, and being named Top Five at the Dubai International Arabian Horse Championships. Vekaisa ‘F’ (Kais x Veronia). Credit Forelocks archives. 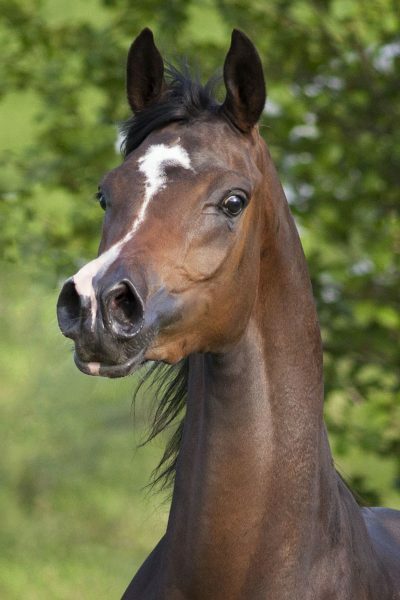 Forelock’s Arabians: A breeder is someone who shows interest in the bloodlines. Someone who does not chase a World Champion to breed with, but really finds the right stallion for his mare. Not only that, a true breeder has their own vision on how to breed and where to go. They do not follow the crowd. We realised that we were successful when we had demand for our horses from the United States, Canada, Brazil and Great Britain. This was around 20 years ago. These days, I guess we have earned a reputation for breeding quality horses. There are still recent successes with our horses around the world, and this gives us confidence with the results of our breeding ideals. Forelock’s Black Jack (Forelock’s Shaheen x BB Jamala by Amalfi). Credit Glenn Jacobs. Forelock’s Arabians: Changes are needed, but how to define them is difficult. One thing for sure is that ECAHO needs to organise and maintain a better system of different levels of shows. For example, after reaching a certain level, do not let the horses go back to a lower level. ECAHO has not arranged good or fair rules and regulations. The number of horses entered in shows continues to go down. I do not think this is only to do with the fact that the big names enter at any level as they do not enter at every show. I think that people are just generally stopping spending the large amount of money that it takes to show a horse, and getting no results in return. If you really want to compete, then your horse also has to go to a trainer. So at the end, you spend a lot of money and you only have a chance of winning a medal if there is little competition. But you might be able to sell your horse at a reasonable price if it is with a trainer, so it is difficult to know what to do for the best. Yody ‘F’ (Kubinec x Yosshima ‘F’). Credit Forelocks archives. I think that it is a good thing that the Arabian Horse Organization (AHO) has started events such as the Chantilly European Breeders’ Cup. Only European-bred and owned horses can compete, horses that are still owned by their breeders. You see a difference there. I still hope this show will continue and that European breeders will continue to show their offspring there. If you go away from this show, you have compete against the big guys from the Middle East who have not only bought the best but now also breed the best. What is also a great initiative are all the amateur shows. There are many more now and many of the trainers are happy to help Arabian horse owners/breeders both in showing and in getting their own horses ready for shows. We participate ourselves with all our grooms at these shows and we have so much fun. It is not only about winning but also the tremendous fun that we have in working the horses back home. We also have trips to Johanna Ullström’s training centre in Belgium to learn how best to get our horse to do a stand up and to move well. We all learn from each other, and there is always a good atmosphere at the show. I hope that the organisers will maintain a correct rules and regulation system so it will stay fun! This can be the future for breeders that do not want to or cannot spend a large sum of money, or to compete against the famous names! Forelock’s Arabians: If showing continues the way that it is, and the breeding fees are out of proportion with sale prices staying low, then yes, many breeders will stop. And if that happens, more – both old and new – breeders will follow. It will also mean that fewer numbers of new breeders will come along. But as everything goes down at some point in the future, we can hope that it will soon start going up again!